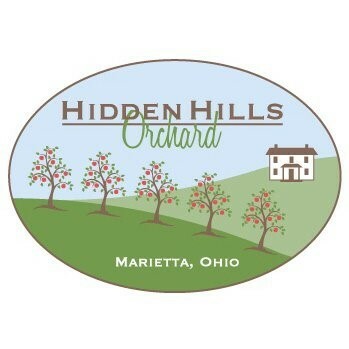 ﻿ Hidden Hills Orchard - Ohio. Find It Here. Hidden Hills Orchard is a high density apple orchard with over 5200 dwarf trees. We are located four miles from Marietta along Ohio SR 26, the covered bridge scenic byway. There are 22 varieties of apples which span the harvest season including Gala, Honeycrisp, Golden Delicious and Gold Rush. We offer both pick-your- own and ready packed apples on farm from late August through November. We produce a delicious cider on site from a blend of our apples. The orchard also has about 80 cherry trees and 150 peach trees that we harvest in season and sell locally.The orchard property has been a farm since 1895. Originally a dairy farm and later hay fields, it was purchased from the Long family in 1998. Over the next seven years dwarf apple trees were planted and trellises installed. In 2001, the packing house was built where we wash and hand pack our apples into 5 pound bags and store them in our 5000 bushel cooler. Cider production began in 2004 and it has received first place awards in 2004, 2013, and 2016 in the Ohio Apples cider contest.